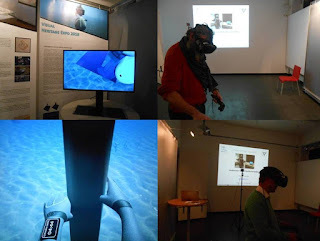 Between the 13-14 November 2018, I gave a presentation entitled "Underwater Virtual Reality Excavation" at the Visual Heritage Expo 2018 in Vienna, Austria. Members of the HCI Lab delivered a live demonstration and many participants tried it out. The demo presented an implementation of an immersive virtual environment for underwater archaeology in the form of a serious game. The main focus is on expanding the player’s knowledge, by teaching them about maritime archaeology and performing two archaeological procedures - tagging and dredging. The dredging procedure was accomplished by implementing and extending an existing voxel-based sand simulation approach and rasterizing it using the marching cubes algorithm on the GPU. The extension of the simulation consisted in adding a custom dredging simulation step that removes the sand from the grid. Also, an alternative approach for sand slippage using a custom heuristic exists. The game is developed for the HTC Vive head-mounted display and uses room-scale experience, allowing the user to move freely in the virtual environment. 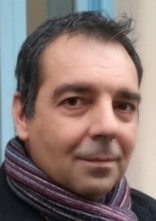 Fotis is an Associate Professor and the director of the HCI Laboratory at Masaryk University, Faculty of Informatics at Brno, Czech Republic. Before, he was the director of Interactive Worlds Applied Research Group (iWARG), Faculty of Engineering and Computing at Coventry University and a research fellow at the Serious Games Institute (SGI). Fotis have contributed to more than 120 refereed publications with more than 2915 citations (h-index: 26 and i10-index: 52) and has been invited 70 times to become member of international conference committees and has chaired 16 sessions in 11 international conferences. He has organised multiple conferences and workshops and he is the co-founder of the International Conference on Virtual Worlds and Games for Serious Applications (VS-Games). Finally, he is a member of IEEE, ACM and Eurographics.